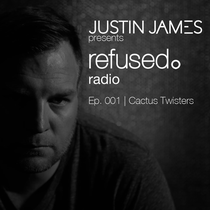 Label boss Justin James launches a new podcast series from his recently birthed record label refused. - which will be featuring an exclusive artist from the label each month. The first episode features Belgium duo Cactus Twisters with one hour of fresh techno through your speakers. You'll also hear new music from Sonate, Julian Jeweil, Paride Saaceni + Stiv Hey, Moog Conspiracy and more. Cactus Twisters is a Belgian duo focusing on electronic dance music. Both DJs and producers, Jey & Ka are known for combining sophisticated house elements with grimacing techno grooves and often like to tell stories which involve darkness, furtiveness and feeling.